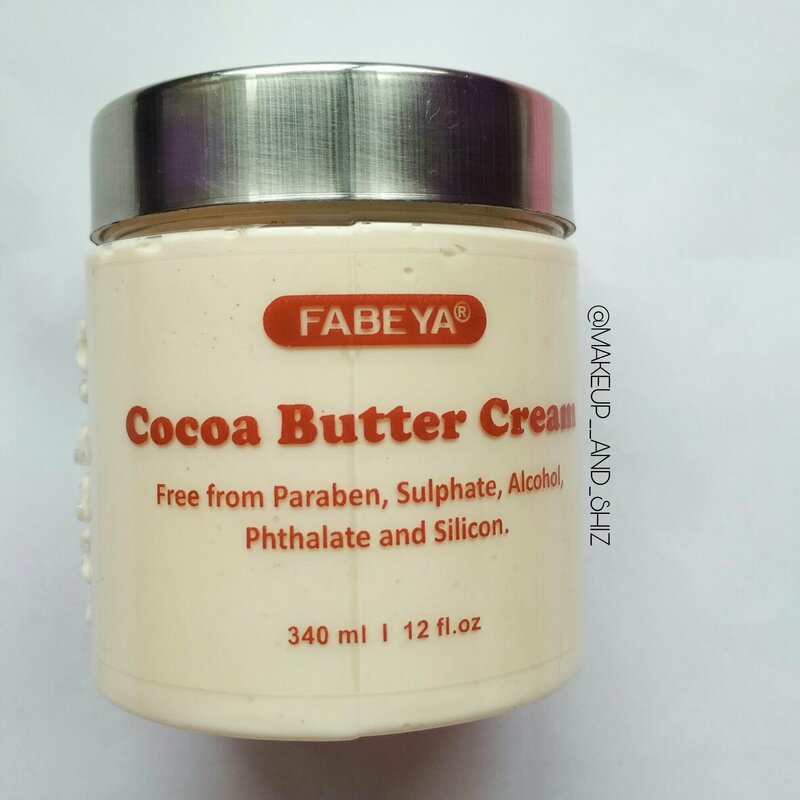 FABEYA Cocoa Butter Cream — Review. Winter is here ! And you definitely need a good moisturizer ! That’s bring us to Fabeya Cocoa butter Cream . Fabeya is a new Indian Brand . Fabeya’s mission is to formulate, manufactured and market world class natural products. I am a 23 year old , Dry skin type. It is available in Amazon India. Click Here To buy. MRP: Rs 349 for 340 ml. Whether you realize it or not, you’ve probably eaten cocoa butter many times in your life — plus smeared it onto your skin. Cocoa butter is a natural, melt able oil extracted from the Cocoa bean. It’s the fat source used to make chocolate responsible for giving it its alluring, melt-in-your-mouth, silky feel.Polyphenols in cocoa butter have several positive indicators for skin health, including improved skin elasticity and skin tone, better Collagen retention/production, and better hydration. It is a big see through tub. All the necessary details being printed on it. It has a silver screw lid. However be cautious with the lid cause it’s kinda sharp at the edges ! Well, Since I belong to the Dry Skin Type, I really like it. It will give you perfect amount of moisturization for 12 hours at least. It makes your skin soft and supple , very smooth too, specially your body skin. I have extremely dry elbow and knee. I applied this everyday twice for a week and I could see a difference. Also, I feel it doesn’t hydrate your skin (as it claims ) but it moisturizes your skin . The only thing I don’t like about this is you have to messaged it into your body skin , since it has such a thick cream consistency. Yes, but before that it’s a big tub. Also Fabeya has a variety of other cream products. I wanna try some more . But I can see myself buying this in winters. Yes. If you are dry/ extremely dry skin, I would suggest you this all round the year. For oily/ combination skin, I will suggest only on winters. And normal you can get hands on any time of the year and work accordingly. Read also : Plum Goodness E-luminence Deep Moisturizing Creme – Review. Very thick consistency. You need to message it in for your body skin. That was all for this post . I hope you liked it. What is your go to moisturizer this winter ?Let me know ! Previous Plum grape seed and sea buckthorn face mist –Review. Next Garnier sheet mask — Review, India.